At this time of year, if you keep your eye open, you can find tall trees in the Sydney North Region with clusters of vibrantly coloured berries. These are native plants called lilli pillis. 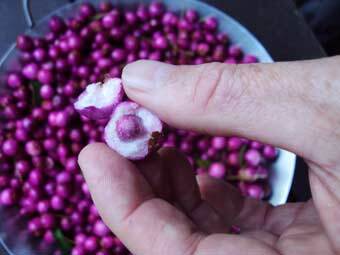 What many people don’t know is that these fruit are very edible and make an excellent jam. When you pick them off the tree and eat them straight away that have a slight tart taste, a bit like a sour apple, but when you boil them and make them into a jam or jelly, they have a unique and delicious taste. Ari and I had a quick drive around our streets looking for lilli pillis. Within 10 minutes I found a house in Berowra with massive trees with large clusters of lilli pillis. I knocked on the door, and asked the owner if I could take them. 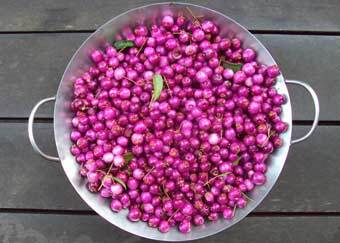 She had no use for them, and within 10 minutes we had 2 buckets full of delicious berries! After picking, I washed them and picked out the leaves and small sticks. I was about to “deseed” them but realised that this would take me days. So, I boiled them instead and strained the syrup through a muslin cloth. The recipe that I found on the net didn’t use the berries after this process, and discarded them but it seemed to be a shame to throw them out after taking the juice out. So, I took the seeds out from each one. This didn’t take long as the lilli pillis were cooked – about half an hour. The recipe for lilli pilli jam is very simple: Mix 250gms of lilli pillis and their juice, to 250gms of sugar, and the juice of one lemon. Mix the lot and boil. I bought a sachet of pectin to throw in, to aid setting. 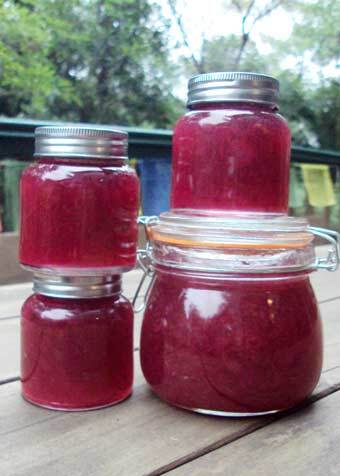 I had my first batch of lilli pilli jam made not long after. After boiling it for about 10 minutes it turns into a vibrant purple. The jars are now in the fridge cooling down. I’m really looking forward to having some for breakfast tomorrow!